After my last batch of chile colorado, I still had several boneless beef ribs set aside for a different use. That’s my way of dealing with the fact that we buy most of our meat in bulk at Costco; it keeps me from getting bored cooking the same dishes over and over. In the case of the boneless ribs, beef or pork, I generally use most of the package for a braised dish that will give us some leftovers, and then break down the rest in another form. This time I sliced up the beef about 1/2″ thick and marinated it briefly in a sweetened soy-scallion-oyster sauce mixture, got some rice going in the rice cooker, then threw the slices on my electric grill. Boneless short ribs can be pretty tender when grilled, so long as you trim them well, slice them against the grain and don’t overcook them. When my meat was cooked through almost to medium and getting a little char from the grill (though not as much as I would have liked; the electric grill just doesn’t have enough punch), I removed it to a plate and went to serve up the rice. That’s when I discovered that I had somehow messed up the most foolproof tool in my kitchen: I forgot to add water to the rice in the cooker. Suddenly, I had a serious problem, because I needed a starch pronto. Redoing the rice would take at least half an hour, during which time my beef would either get cold or overcook in a warming oven. Rummaging frantically through my pantry, I came across a half-packet of mai fun rice sticks, which are Chinese vermicelli noodles, leftover from the last time we made fresh spring rolls. The back of the packet had instructions for deep-frying the noodles, which sounded like an ideal solution for my problem. I dumped an inch or so of oil into my cast iron skillet, heated it up, and dumped in a handful of dry mai fun. Talk about your instant starch! Within seconds I had a plate-sized nest of crunchy puffed rice noodles. It wasn’t the perfect match with my beef, simply because the mass of noodles were pretty dry and would have benefitted from a saucier topping, but it worked in a pinch, and honestly seems like a sort of culinary magic—very impressive to see! Slice the short ribs into 1/2-inch pieces, then place them in a Ziploc bag or Tupperware container with a tight fitting lid. In a small bowl, mix together the sugar, oyster sauce, soy sauce, sake (or mirin or sherry), garlic, and the whites of the scallions. Pour the marinade over the ribs, seal bag or container tightly, and marinate in the refrigerator for 1 to 2 hours. Halfway through your marinating time, flip the bag or container upside down to allow the marinade to penetrate all of the meat. When ready to cook, preheat your grill to high. Oil the grill grate (use long tongs to hold an oil-dipped cloth) and place ribs on grill. Cook the ribs until done to your preference (about 3 to 4 minutes per side for medium) and nicely browned. Your ribs could cook more quickly, or take more time, so watch them closely. 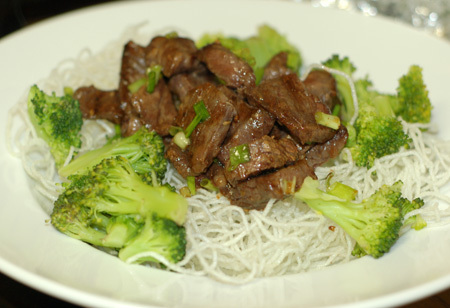 Serve the ribs over rice or puffed rice noodles, sprinkled with the sliced scallion greens.